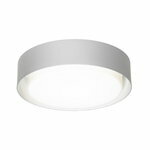 Marset’s Plaff-On ceiling lamp was designed in 2010 by Joan Gaspar. Plaff-On's appearance is at the same time discreet and sophisticated as well as informal and distinctive, and it fits easily into both private and public contexts. The white opal glass diffuser fills the space with smooth, clear light, and the aluminium ring around the diffuser reflects the light upwards creating a beautiful glowing halo. Besides a ceiling light, Plaff-On can also be used as a wall lamp. Joan Gaspar (b. 1966) is a Spanish lighting designer who has designed lamps for brands such as Marset, Santa & Cole and Vapor since 1988. Gaspar has studied industrial design in Barcelona and also given classes at the Elisava School of Design in Barcelona. During his career, Gaspar has won the Spanish Delta de Plata award twice, and in 2000 he received the first prize at the Valencia International Furniture Fair. In 2002 he opened his own studio in Barcelona.